MUNICH — Some like to tiptoe into a new job. Kirill Petrenko, 41, prefers to plunge. The fresh Generalmusikdirektor at Bavarian State Opera is now deep in rehearsals for his first production here: Strauss’s ambitious, arduous Die Frau ohne Schatten, uncut apparently. 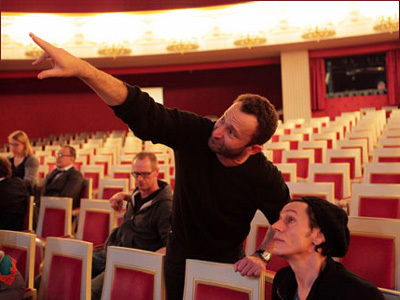 Krzysztof Warlikowski directs. Known in Munich for a loosely cowboy, loosely gay 2007 Evgeny Onegin, the Warsaw-based régisseur brings a strong background in legitimate theater. Whatever the director’s take on Frau, though, Petrenko will stand in his own light. He calmly weathered lengthy booing at his Bayreuth Festival debut this summer, for Frank Castorf’s provocative staging of Der Ring des Nibelungen, only to receive praise later for his conducting. Die Frau ohne Schatten opens on Nov. 21. That will be fifty years to the day since the same opera reopened the company’s war-gutted home, the National Theater, in a legendary performance conducted by Joseph Keilberth. Adrianne Pieczonka and Johan Botha sing the imperial couple, Elena Pankratova and Wolfgang Koch their mundane counterparts. Deborah Polaski essays the unpleasant Amme. On Dec. 1 the performance will be streamed online without charge at www.staatsoper.de/tv. As it happens, Petrenko’s second opera as GMD will be a revival of that Warlikowski Evgeny Onegin, opening on Jan. 4, 2014. This entry was posted on Tuesday, November 12th, 2013 at 12:49 pm	and is filed under Munich Times. You can follow any responses to this entry through the RSS 2.0 feed. Both comments and pings are currently closed.